Welcome to 2014 time to up date. Welcome to my blog! There are two pages. Add Besan, garam masala, chilli, salt & tumeric into bowl add ½ cup water slowly while mixing to a thick batter, add more water if needed ( don’t make it to runny) add garlic. When cooked before serving, reheat pan and place again in smoking pan to crispen up don’t burn them. If the Besan Flour is too strong add half selfraising flour. Serve the doughnuts hot or cold. Try this recipe and see what you think . Add dressing when about to serve. We all love Chicken Fillets. You will need to cook the chicken a bit first till lightly brown then let it cool. Heat a small ammount of butter and oil in a frypan and cook the fillets till lightly brown. Place 2 sheets for each fillet of filo pastry on a tea towel and paint with melted butter top with second layer. Fold the pastry in half and add your Chicken Fillet. spread Chicken with some of the Mustard Fold sides of pastry over the Chicken and roll it up to form a parcel. Place on the oven tray and brush with butter, bake for approx 20 minutes untill golden brown. Add Lemon Juice to the reserved juices in the frying pan, stir in the coriander,ginger and cream. Stir till thicken slightly pour over the cooked Chicken when serving. Sautee the garlic and onion in olive oil, add the salt, pepper and soy sauce, once is slightly soft add the steaks. Sautee for a few more minutes and add the cilantro. Remove from the heat. Heat or cook the 2 tortillas both side, set one aside. Top one tortilla with the grated mozzarella cheese and the steak. 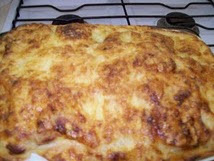 Place the second tortilla on top and let it brown both side, until the cheese is melted. Cut into 4 slices and serve hot. 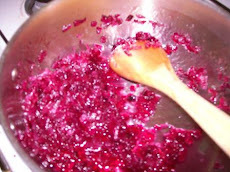 Stir to form a puree. sit in fridge for at least an hour. taste) in medium bowl. Add flour and combine well. Mash chickpeas, ensuring to mix ingredients together. You want the result to be a thick paste. Serve falafel by itself, or with hot pita bread with veggies, hummus, or tahini sauce. I’m the only one in my house that loves this, my partner Rod likes his calamari crumbed and deep fried, me I like it sautéed till tender and served with a toss salad . Whisk all ingredients together. Pour over salad mix thru. Place chicken stock, carrot, red capsicum, sultanas, olives and lemon rind into a small saucepan. Bring to boil, add couscous and cover. Place on a low heat for a few minutes until liquid is absorbed. Add tuna and lemon juice, stir through couscous using a fork. I found this mousse to be really yummy especially as I love strawberry's and a fan of Mousse. Wash and remove the tops of strawberries, mash well. Add gelatin to the water and let stand for a few minutes then dissolve it over hot water. Beat the egg whites until it has soft peaks then add sugar gradually, beating until dissolved. Whip the cream until it has soft peaks and fold into egg white mixture. Add strawberries and lemon juice and fold in lightly then pour the mixture into serving dishes or glasses and refrigerate until set. Whisk the egg whites with an electric beater to floppy peaks and gently fold the egg whites into the potato mixture. Fill the ramekins with the mixture. Bake for 15 minutes until puffed and golden. Love this dish I often add some white sauce as well, stacks are great for all the family and are gaining in popularity . On baking tray, layer the tortilla first then salsa and cheese then capsicum and onion and last the mince keep layering or until golden brown. We all love a pasta with some pesto, it has become such a popular dish over the last decade you can mix a little bit with your salad dressing for an enjoyable change. I remember having this as a child,it was one of those treats that we had on a rare occassion. If I had know how easy it was to make I would have made it myself as a child. It has a strong cinnamon spicy flavor so may not appeal to all but worth a try. I must wish all the best for 2011 and must apoligise for being away for a couple of months I have been busy studying online and time got away. I am back now with a series of new recipes I hope you enjoy. These Pasties are real economical and yummy to eat I always make about 12 a time and freeze them. Dates are not an expensive item, they are great to use in slices. 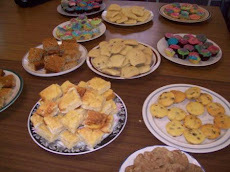 I am catering later this week with my students and these are a couple of the recipes I will use. Cook the dates in water and bring to the boil. Allow to cool to luke warm then stir in sugar and beaten egg. Add dry ingredents and stir in crushed nuts. Pour into a well greased and [papered tray. When cool add icing and sprinkle with nuts. Shape 2 level tablespoons on mixture into a ball place on tray with about 5cm space. We all ahve a version of Anzacs. Mix oats flour, sugar and cocnut. This creamy dish is wonderful so easy to make and served with a salad will delight those that eat it. 2 eggs seperated, beat egg whites till stiff. Mix in egg yolks one at a time beat till smooth gently fold in (using a knife)whipped cream then stiffened egg whites. 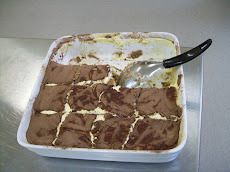 Spoon into individual serving dishes and refrigerate serve with extra whipped cream and grated chocolate. The first time I had this was in 1976 I remember it well , I was living in Sydney when I tried it. Add the pasta and salt to boiling water, and boil till aldente then drain. Add vegetables to pot of water and boil till cooked, drain. Mix the spaghetti ,vegetables, eggs, milk and cream together season and add to greased frypan. Sprinkle with cheese , cook on low heat, with lid on finish off under grill with lid off. This is a delicious way to feed a family.I use pasta sauce as my tomato base on top of the potato. Peel and cook the potatoes in boiling water till ready to mash, drain and cool. Return potatoes to saucepan over very low heat,add the oil and season to taste,mash till no lumps. 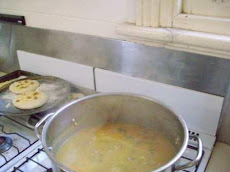 While potato is cooling preheat oven to 220 degrees C.
Grease and flour shallow baking dish and spread potato evenly. Bake in oven for 15-20mins. Cut capsicums and onions fry in pan till cooked remove keep warm. Roll add to a Grill press, or serve warmed with salsa and sour cream. Combine vinegar and brown sugar in a small saucepan over medium heat. Stir to dissolve the sugar. Simmer 5 minutes or until reduced slightly. Heat a char-grill pan over high heat, cook the rockmelon that has the prosciutto wrapped around it for 1 minute each side. Shallow Fry in oil till golden brown. Half capsicums and remove seeds and place in oven till blisters and skin peels, chop in large pieces and combine with oil vinegar garlic and mint while still warm. The students and I have made this recently and we used the purple spanish onions for the Jam they were glorious with the lamb mince. And roll into meatball shapes, cook meatballs until browned, serve with onion jam. Cooking is so easy when you follow a simplistic recipe this one is so tasty and easy you wont make a mistake. Serve on a bed of salad. Grease and line with baking paper the base of a cake tin. Melt the chocolate, golden syrup and butter in a bowl over a saucepan of gently simmering water. Place eggs and sugar in a mixing bowl. Beat on high for 10 minutes until very thick and pale. 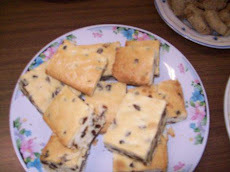 Gently fold in the flour then fold in the chocolate mixture until combined. Pour into the cake tin and bake on the middle shelf of the oven for 15 minutes. The use of Raspberry Jam in this dish creates a tasty glaze the kids will love them. In a small saucepan, combine jam, vinegar, soy sauce and chili over low heat. Stir until well combined and creates a marinade. In a large bowl, toss chicken wings with half of the jam mixture. Place on a tray with foil and bake for about 30 mins. Brush wings with remaining jam mixture after 30 minutes before serving and cook further 10 mins to create a glaze. Pork spare ribs can be a cheap cut to buy and this is certainly a great tasy way to prepare them. Combine all ingredients . Marinate the lamb and refrigerate for 3 hours. Save excess marinade. Bake or gently shallow fry until pink inside. Baste with extra marinade half way through. 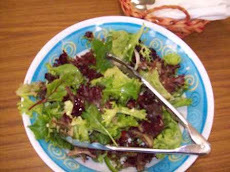 Slice and serve on a bed of salad leaves. Drain pineapple,save the juice,and put the pineapple into a saucepan with 1/2 cup of the juice. Pour into the prepared tin and bake in moderate oven for 1- 3/4 hours. You can make versions of lasagne many ways using all sorts of vegetables ,breads and pastas. I cooked the chicken in just a small amount of oil. Toast sesame seeds in oil. With apples in season here in Australia this recipe is perfect if you have an abundance. Just peel core and slice apples and cook with a about 1/2 cup water till soft and a teaspn sugar. You can do it in the microwave or on the stove. You are after the consistency as apple sauce you buy commercially. You only need a cup full of apple sauce. 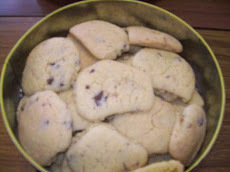 Combine biscuit crumbs, butter, golden syrup and cocoa and press into a greased pan. When firm sprinkle your coconut on top. In a pan add chocolate milk and icing sugar stir over low heat till melted. Pour over slice let set and cut into pieces.. I melt chocolate in Microwave, if you are doing this add the chocolate to a dish and place in microwave for 2 minutes stopping and stirring every 30 seconds if you need more time do in 10 second hits stirring at each interval..Don't Burn... then add the milk and icing sugar at end..
Refrigerate serve cold or hot. You can use burrittos for this I often make my own with just flour and water or sometimes I use yeast it works any way. I also buy homebrand burritos you get 15 and they can be frozen. water if needed or chicken stock. The secret to good chicken is to poach it in water so add chicken to a casserole dish with a chicken stock cube and just enough water to cover mix in with about 1/2 teaspoon of cummin or taco powder. Add cooked Chicken to burritto bread also add a small amount of grated Cheese and a spoonfull of enchilada sauce roll up. When times are tough this recipe is a beaut, served with mash potato and green beans. 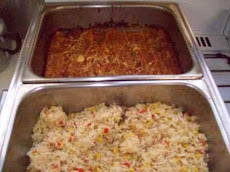 When you get to this stage add Water and stir till the gravy boils and thickens add tomatoe and worchestershire sauce. This is a favorite that goes back to the early 70,s when I was a flower child. I read a book about the Hunza people and their longevity..
Rub in butter to flour, wheatgerm and salt till resembles breadcrumbs add water to make a dough, Roll out half and line a greased pie dish. 2 bunches of spinach (you can use silver beet if you like I do as i grow it in my garden) Cooked in a small amount of water and drained (squeeze out excess moisture). 500gms of potatoes cut into small cubes and cooked. Combine spinach, potato, cottage cheese,herbs, S/P and nutmeg allow to cool fill pie pastry and add lid press edges together bake in oven at least 30 mins till cooked and golden. froths up and becomes pale. Cut bread into small circles form into cups by placing into a greased muffin tin. 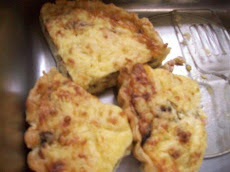 When I have guests that are vegetarian I make this as a speacial treat, it always goes down well and is enjoyed by all. Cook cannelloni in plenty of boiling water. When cooked and while still firm add 2 cups cold water to slow the cooking process. Set aside till ready to fill. 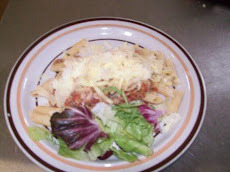 Want to try something tasty that everyone will love its a Mexican lasagna really. You will need to make some white sauce first. Heat 1 tsp oil in a large fry pan and cook the onion until soft and transparent. Add sliced capsicum cook till just soft. Remove from heat. Add drained beans and tinned tomatoes to pan add garlic, taco seasoning and cumin s/p. 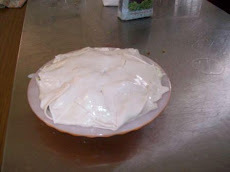 Grease a pie dish (roughly the same size as the tortilla). Place one tortilla in the bottom of the greased dish, then layer with tortilla bean mix and cheese sauce repeat finishing with tortilla and finally cheese sauce finally sprinkle with cheese. I Love Rissoles and add lovely fresh herbs, great with mash potato and greens a bit old fashioned but still yum! This potato recipe comes with its own dressing Its fairly new to me my sisterinlaw raves about. Peel and cut into about pieces. Place the egg into a small bowl and beat slightly with a whisk. Cook the bacon until crisp, drain sprinkle over potatoes. 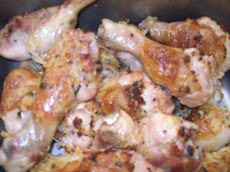 I love this recipe its one that is excellent if you have left over chicken. I buy pre made pastry or make my own using the food processor. Cook chicken or buy one already cooked. I remember back when I worked for Olga Mueller at the Gourmet Deli, this torte was one we used in catering, we decorated it with lots of fresh cream and chocolate. Grease, flour and line a 23cm cake tin. Add the chocolate and pulse to break it up, tip into a mixing bowl with other ingredients. Whip the egg whites in a clean bowl until soft peaks form and slowly add the sugar. Beat until glossy and stiff; “gently “fold into the chocolate/nut mixture. Spoon the mixture into the cake tin and cook for 25-30 minutes in a preheated low 160C oven. The cake should spring back when gently pressed if cooked. Fill and top with whipped cream decorate with chocolate twirls. This is a lovely lasagne easy to make and tastes delightful, my Esl students will be taught this recipe and we will sell it at our cafe at the college. Put the cheese and ricotta in a large bowl and mix together, and then take out half the mixture and set aside. In half the mixture add the pesto to the cheese in the bowl and blend until smooth. Stir in the spinach add chopped garlic and seasoning to taste. Grease a baking dish and spread a layer of pasta on the dish then one-third of the spinach mixture over the base of the baking dish, Spoon one-third of the tomato sauce in an even layer over the spinach mixture, then cover with a layer of pasta. Add half of the remaining spinach mixture in a thin layer, top with half the remaining tomato sauce and cover with pasta as before. Cover with the last of the filling and arrange the remaining pasta sheets over the top. Whisk the reserved cheese mixture with the eggs, milk and seasoning. Pour over the lasagna, then sprinkle with a mixture of the breadcrumbs and parmesan. Bake for 25 minutes until the topping is lightly set and browned. Serve while hot. 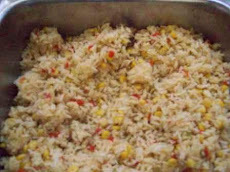 I make this dish a lot its one of Rods favorite, I often have it as a main or serve as a side dish. Peel mushrooms and remove stems (don't throw them away) chop stems into small pieces and add Bacon and cheese, mix together and fill mushrooms with the mix. Bake 20-30 minutes till everything is cooked and golden brown. I love Roasted capsicum and add them to salads all the time. they mix well with tomato. Bake in oven until blisters appear, peel skin off. place capsicum in oven on tray and cook till blisters. When done cut into strips and scrape off seeds. Place garlic,oil,cumin, salt/pepper and lemon juice into a jar and shake. 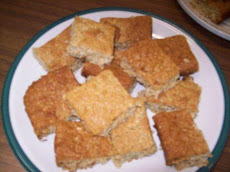 I don't have a real sweet tooth but I do love these they are so easy to make and are a yummy treat, good with a cuppa. If you prefer melt the Chocolate over a pan of boiling water if you are worried you may burn the chocolate. Blend flour sugar and butter in food processor then add the egg and water to make a dough. refrigerate in plastic wrap for about 15 mins roll out and line greased tin . Combine the condensed milk, butter,and golden syrup in a pot , stir over a low heat till butter melts and mixture thickens "Don't Burn"pour over the biscuit base. I love pancakes and eat them fairly regularly, I always have some in my freezer as I like them sweet or savoury. This recipe is one of those" what shall I do for sweets tonight" type recipes. Place pears in a pot with 1 cup water, simmer gently till soft, remove from heat. Save liquid separately and let the whole lot cool. 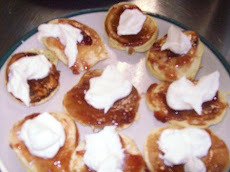 Mix pears and jam together, and place spoonfuls in centre of each pancake roll up and place in a greased ovenproof dish. While that is baking blend custard flour with a little pear juice till a runny paste. heat up remaining juice and cream, add sugar whisk in cornflour paste stirring until sauce thickens . We all love potato as a side dish and for the family this one is a beaut. Layer the potatoes and onion with the grated cheese some of the cheese. Finish with a layer of potato slices save some cheese for the top. Mix milk cream and crumbed stock cube pour over the potatoes and then sprinkle with remaining cheese. Cream butter and sugar add eggs one at a time, beating after each egg, add mashed banana and vanilla and beat. Add flour and milk alternately and stir till mixed well. In a pan combine sugar and water and stir till sugar melts then bring mix to boil and boil without stirring until mixture turns a slightly golden, remove from heat and stir in cream and bananas. When I was a youth one of my first recipes I made was this pickle.The secret is to soak the vegetables in brine for 24 hrs, I love the pickle on salada biscuits with cheese or with cornbeef. Blend dry ingredients with some of the vinegar,combine it with the vegetables and add remaining vinegar. Bring to the boil stirring all the time and remove from heat, place in sterilised jars. I have always loved a boiled fruit cake, I once made a couple in a hurry for a quick 2 tiered wedding cake for a friend, whos wedding cake had been dropped and broken. There are many uses for a white sauce I use this recipe when I make roulades, lasagna,voluvants,stuffed pancakes,tuna mornay and cauliflower and cheese sauce to name a few. Pears have delicate flavour and this recipe certainly enhances them. Its only takes a couple of minutes to prepare. Arrange cut side down in greased baking dish. Bake for 10 mins at 200degrees C then reduce to 180degrees C for 15 minutes. Over 20years ago I worked in a Mexican restaurant, it was hot hard work but the food that was created was delicious, the restaurant is still here in town, and still popular. During my years of bush living this dish was a regular when we ran out of meat,we picked fresh mushrooms grew spinach and I always had cheese, I make my own tortillas. Fry onion in oil till soft, add mushrooms garlic and chili. Add the spinach and cook till soft. fold in the ends and roll up ensure the tortillas are sealed. Deep fry turning once till crisp and golden brown. In Australia Jams are a family favorite and we devour many varieties during fresh fruit season, At present my Lemon and Orange trees are filling up with fruit so marmalade will be our breakfast treat. These easy recipes are the most basic you can make, but certainly make Jam making affordable. Always wash Jars in hot soapy water and rinse in hot water, place in oven to dry this is a good sanitiser. Place prepared fruit in a dish (not metal) and cover with the water stand overnight. Cook for 20 minutes till setting point has reached. Its amazing how great a homemade onion soup is, its easy to make and delicious. We tend to forget about onion as a feature in a meal we generally add onion to something else. Try this for a tasty starter. Add the stock,S/P and simmer for 30 minutes add Wine. Serve in a bowl place crusty bread and grated cheese on top of soup and grill till cheese melts. When I was 21 I cooked almost every recipe in a cook book I got for my birthday. This Steak and kidney pudding was one of them, its an oldy but a goody. I made it for years for my son who loved it, but in the last decade I have only cooked it a couple of times a year but I still love the flavour. Add flour and salt/pepper into a blender add butter blend. Knead pastry cut into 2 enough to line a greased pudding basin. Save enough for a lid. Wash and cut out the core and chop kidneys into pieces toss in flour. Cut steak toss in flour,add to greased pan and fry till just brown,add a small amount of water and more flour if needed to make a gravy, add 2 beef stock cubes . cool. Fill pastry lined pudding basin. Roll out pastry lid and add to the top press edges well to seal. Cover with greased paper and foil tie securly under the rim. Place in pot of water that reaches just over 1/2 way up pudding basin, add lid to pot. Steam for 3 hrs adding water when needed, do let the water get too high or too low. Winter is coming so my diet changes to more comfort style foods. Pumpkin lasagna is very easy to make. If you are a pumpkin lover as I am, you will find this a beaut. 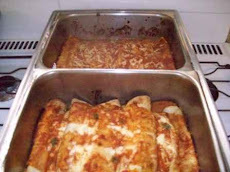 Ensure lasagna sheets use fresh or sheets that need to be cooked for best results. Mash or puree with 1 clove garlic s/p and ricotta cheese and vegeta. Mix tomatoes, basil and 1 crushed garlic together and add on top and finish with grated cheese. I love to add these as an evening side dish or for a quick lunch with salad. Wash the grated potatoe in cold water and squeeze to get excess water out. Combine potato and carrot add eggs, flour and cummin seeds stock cubes and s/p. There are so many ways to serve pasta and I have tried many over the years. This is so easy, ricotta is still reasonably cheap even though it has doubled in price over the last 3 months. In a saucepan, melt the butter,and add leeks cook till soft. In a bowl mix ricotta and sour cream s/p, crushed stock cube and add to bacon and leeks stir and cook till sauce has heated thru. (if you need to thin it out more add a bit of milk. Add grated cheese. Traceys "Never Fail Sponge Cake"
I have never been any good with sponges as I'm too heavy handed with such a delicate food. This recipe however was given to me from a student who made it for my birthday. 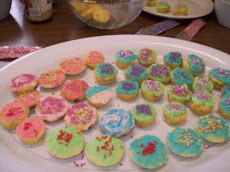 It was a success when I made it myself, so I hope you like me will find it a never fail sponge. Add meatballs to sauce simmer around 5 minutes. I love Filo pastry I dont use Frozen filo I like it from the fridge or fresh,and use it often for many dishes. I remember when I first came across filo in a small delicatessan in Smith st Collingwood in my early 20,s. The Deli transformed my way of cooking. Smith st Collingwood was a multicultural diverse town before it turned upmarket and unaffordable. This is a simple yummy vegatarian dish. Add filling to bottom half of filo fold the ends over and roll into strudel shape. 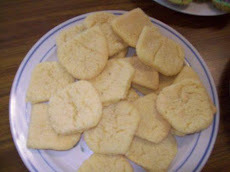 250 grams Marie or arrowroot biscuits. Place butter, sugar and cocoa in saucepan over low heat. Stir occasionally and when sugar is dissolved take off heat and add egg. An Australian Favorite this lovely winter soup,I learnt to make this as a child when shanks were sold as dog bones. Prepare vegetables and cut into small dice. Fry meat bones in small amount of oil till they change colour,add vegetables to pot and fry for 1 minute add water and bring to the boil. Add pearl barley Salt pepper and stock cubes ,Stir. Simmer for at least 2hrs hours stiring occasionaly so that soup does not stick to bottom of pan. Adjust salt and pepper and stock cubes by taste. When cooked remove bones and chop meat into small pieces and add back to soup. You can cool it and skim of any fat that rises for a healthy version. When looking for something simple I often make a quick ratatouille especially when egg plants are in season,they always reminds me of “Fawlty Towers” and Manuel. to stand for 1 hour then drain. Chop tomatoes and cut peppers into cubes and finely chop the garlic. This sweet can be served with many sauces I have tried them with a Strawberry sauce and as an Indian dish with a rose water syrup. Heat oil in pan and deep fry till golden brown roll in sugar and serve with your sauce choice. If your Lemon tree is in abundance like mine you are always looking for ways too use Lemons, This lemon custard tart is easy and yummy. The pastry can be made in the food processor so its real simple to make. Add flour,butter and sugar to processor and blend, add the egg whisked with cold water, process till it starts to bind together. In a medium bowl, combine two packages of mascarpone cheese and 1 can of condensed milk. 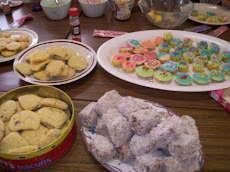 Allow to cool then dip sugar coated biscuits in the coffee one by one until moistened. Finally put some chocolate powder in a sieve and sprinkle on top of the dish. Add flour to a bowl with salt and oil. Melt the butter and cook the mushrooms until they are cooked but not too soft add seasoning and stock cube . Add the mixture to the white sauce season and then place the filling into each pancake. Preheat oven to 180°C. Grease an 8-cup capacity ovenproof baking dish. Sprinkle combined sugar and cocoa over pudding. As I look through this blog and see the recipes I have written I stop on occasion and remember the first time I tried the dish and how it developed over time. Some recipes are as far back as the late 60,s but all are still enjoyable today. The changes in food in Australia have come about because of our diverse cultural environment. New trends are the coming together of cultures and flavours. I always embrace new tastes and flavours and hope you are enjoying the same experience with this blog.